In the 1990s, Scott MacManus, current CEO of the Alaska Gateway School District, began ordering feasibility studies on using wood energy to heat the largest school in the district — the 70,000 square foot Tok School. first year, the facility saved the school around $100,000 in heating costs. The cost of heating the school during a long and bitterly cold winter was between $100,000 and $300,000. Cost cutting was a central element of MacManus’ query, as was utilizing alternative energy sources and seeing the project through to a successful completion. 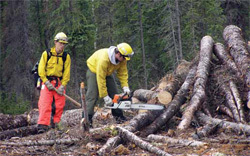 In 2006, the next key player to enter the scene was Jeff Hermanns who had fought wildfires around Tok in 1990 and had returned as Area Forester. “When I looked at Tok, it sat amongst 40,000 acres of continuous fuel. I knew we had all the factors for a catastrophic fire,” says Hermanns. With real concerns for people living in Tok and the spiraling costs of fighting fires, he developed a plan that initially focused on reducing the risk of fire while feeding the local timber industries in the area. 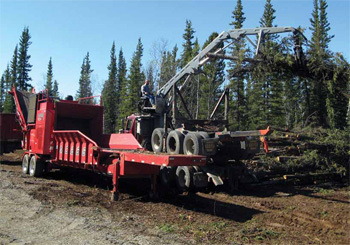 Foresters removed black spruce in designated areas to reduce the risk of fire around the community and minimize entrapment of Tok’s populated areas. Then his vision of utilizing the forest and contributing to the local timber industry stopped short. With trees averaging three inches in diameter, no large pulp mills, and a limited demand for firewood, Hermanns ruefully admits to watching the thinned trees go up in smoke. Pictured is the bin inside the biomass facility that holds the chips. The chips are carried by a conveyor belt and auger system into the boiler and burned at 2,000 degrees. Hermanns persevered with his goal of 100 percent utilization of the forest. He finally found the key — a Rotochopper grinder that was part of a grant. “It’s what we call gut, feathers, and all. You put the whole bird in the soup,” he says. They chose a midsize grinder, this was the one that fit their needs. 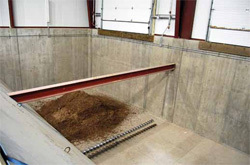 All trees less than 18 inches in diameter could be fed whole into the Rotochopper grinder and processed into wood chips. Once the black spruce had potential as a fuel source, MacManus and Hermanns looked for a system that could use the identified fuel. They also communicated their ideas to local organizations and individuals within the community ensuring that as the project grew, there was opportunity for involvement at all levels. “We had to prove concept,” says Hermanns. A wood chip boiler system was identified as capable of utilizing the fuel source. Even before there was a $3.2 million state renewable energy grant in place for its building, the grinder was already at work thinning trees at the Tok school site. When the grant assessors arrived, the fuel source was being stacked neatly into decks in readiness for the proposed boiler. This was no paper proposal; it was already a work in progress. Under the direction of Rex Goolsby, construction on the Tok Biomass facility commenced in May 2010 and finished in October 2010, on schedule! A Wildfire Academy in Tok offers young Alaskans a chance at a career in firefighting. Students gain chain saw skills by felling trees that are destined to become fuel for the school. Pictured here is Jacki Horton’s saw class. The utilitarian building houses a 5.5 million-BTU steam boiler that produces the school’s heat. Whole small trees are fed into the Rotochopper grinder, which chips directly into a fuel bin that can hold 120 tons of chips. The chips are carried by a conveyor belt and auger system into the boiler and burned at 2,000 degrees Fahrenheit. Finally, an Electrostatic Precipitator (ESP) filters out particulates before the flue gases rise from the stack. So efficient is the boiler and ESP, that even on the coldest winter days, pilots on a nearby flight path report seeing only a tiny plume of smoke. The facility’s unique design integrated the needs of an artic environment with the rigorous safety standards that school premises required. Many local people were employed during the construction phase, and additional maintenance staff were recruited to maintain the boiler throughout the school year. The boiler was turned on in November 2010 and ran 80 percent of the time during the heating season. MacManus estimates that in its first year, the school district saved $80,000 to $100,000. 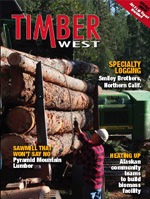 The partnership between the Alaska Gateway School District and forest industry has enabled employment opportunities and skill growth for young people in the community. A Wildfire Academy in Tok offers young Alaskans a chance at a career in firefighting. Some of the skills participants develop at the academy are directly associated with the Biomass project; students gain chain saw skills by felling trees that are destined to become fuel for the school. 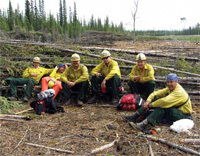 The Tanana Chiefs fire crew is a unit made up mostly of graduates from the Wild Fire Academy. This contract crew is in its first year of operation. Susanna Gibbons, a sawyer on the crew, joined this unit after graduating from high school in Kenny Lake, Alaska, and completing training at the Wildfire Academy. Vincent Nickoli is another young sawyer on the crew who graduated from the Wildfire Academy. “We are looking after the seniors in the community,” he said, “getting their yards fire safe. One elder lady made us coffee and gave us cookies.” He grins as he recounts the work the crew carries out for seniors in the community to remove the hazardous trees around their homes. The trees from these homes also end up at the biomass facility. The energy level of this crew is infectious, and it is hard not to be inspired by their can-do attitude. They are eager to tell of their work that benefits the community, but there is one more role that they fulfill. They are ambassadors of forestry work and models for young people in rural Alaska who do not always have opportunities for careers and well paid employment in their tiny villages. the community would like to use that excess fuel for something more productive than fire. Forestry is also a beneficiary of cost cutting. “By the school using the wood, it is saving me a minimum of $1,000 per acre,” said Hermanns. He went on to point out that it is also cheaper than a wildfire, which can cost between $10,000 and $20,000 an acre to fight. The community acknowledges that burning the hazardous trees in a highly efficient boiler is preferable to an uncontrolled wildfire where there are serious smoke related health issues and the possibility of evacuation. There is no foreseeable end to the fuel source. The boiler will burn about 40 acres worth of wood per year, using only one third of the area that foresters want to clear in the 30 years of the project’s lifespan. Enough wood to fuel the biomass for seven years is already decked neatly in the forest waiting to be moved to the school for processing. This summer the school district is adding a steam turbine generator to the system, which could double their savings. Also in the pipeline are large greenhouses on the school premises, which will be heated and powered by the biomass facility. Students will be actively engaged in acquiring horticultural skills through the food services program being developed. The food grown in the greenhouses could possibly supply six of the schools in the district with fresh fruit and vegetables during the winter months. Many times, key players in this successful project were told it could not be done. Now with a stellar performance over the project’s first winter, the calls are flooding in from across the state. Hermanns, MacManus, and Goolsby answer the queries and calls for advice. They offer that communities should know their fuel source and be able to engage the community to support the process of harnessing the fuel source effectively. There is hope that state organizations and agencies can assist communities to move their proposals forward by offering feasibility studies, funding, and support.